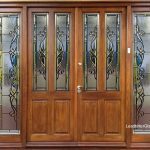 There are many leaded glass finishes such as Soldered, Antique or even Iron and they can all create the perfect look that you are trying to achieve. Pricing for options 1 & 2 are included in any quote you receive, if you require soldered lead or any of the other options, please ask for a quote including your preferred lead finish. 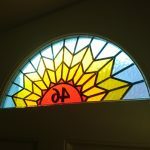 The lead strip will be applied to both sides of the glass and if colour is required, this will be in the form of Overlay Stained Glass film and will be located under the lead strip on the inside face of the glass. A natural lead finish is created by using pure lead that will start life as a bright silver colour but over time will become dull and grey as it oxidises. When oxidation occurs the lead will discolour and may even leave a white residue but eventually the lead will become a consistent grey colour. 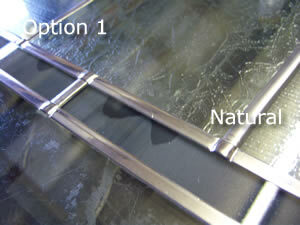 Where the lead meets up with other lead, the joints are ‘boned’ down (crossed over) in the direction of the lead. This lead has been the most popular choice of lead over the years and gives a great traditional appearance as long as the lead is cleaned on a weekly basis for the first few months or years. This lead strip has a slightly domed profile. Also known as ‘antique lead’ finish, this leaded glass effect has recently become the most popular request of our lead finishes today. The application process is the same as Option 1 but this aged lead is pre-aged with a powder coating colour coat during manufacture of the lead so this will reduce the chances of the lead oxidising through time although oxidation can still occur. This lead has a dark reflective appearance that helps make the design more prominent compared with the natural lead finish. One of the few drawbacks to this lead is the inconsistency in batch variation. One batch of lead may appear darker or lighter than another batch of lead so exact matches cannot be guaranteed if orders are placed at different times. 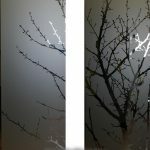 When different thicknesses of lead are used on the same glass panel, there may also be a variation in colour of the two lead profiles but both will be ‘aged’. This lead strip has a slightly domed profile. 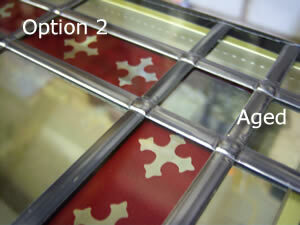 This leaded glass finish is created by using the natural lead from Option 1 and instead of connecting the various sections of lead together using the ‘boned’ method the lead is soldered together using the same technique as used in traditional stained glass. As this is natural lead, the lead will again start off with a bright silver appearance and it will gradually oxidise and become a dull grey in appearance as with Option 1 above. 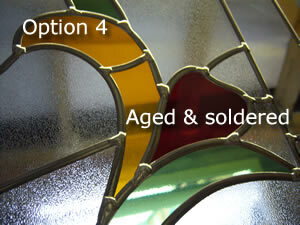 This lead should be cleaned regularly over the first few months to avoid staining of the glass and the lead itself. This lead strip has a slightly domed profile. The aged and soldered finish is created by using natural lead and solder as described in Option 3 with the addition of a darkening chemical added to the lead after soldering. This sheen chemical instantly ages the lead giving it a darker appearance. As this lead is not colour coated it will still oxidise over time and will discolour with a white discharge until it stabilises to give a consistent dark finish. 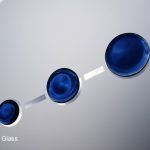 This new colour coated lead gives an amazing finish to the glass design. The colour is applied to the lead in a technique known as powder coating and this process gives a beautiful effect. Note: this lead is not guaranteed for external use so should only be used for internal glass or inside of triple glazed sealed units. 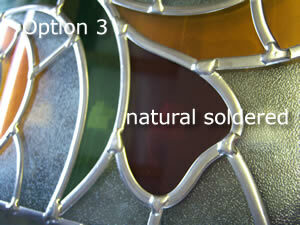 Antique Copper lead can be used in conjunction with our colour film to create coloured leaded glass. This lead can also be used to surround bevels from our extensive bevel range and by choosing the right coloured film to compliment the design, Antique Copper Lead could be the ideal choice for your decorative glass project. 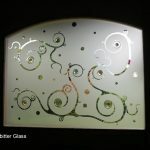 Feature leaded glass designs that are ideal for use with Antique Copper Lead are being created now and will be added to our Gallery in the coming weeks. 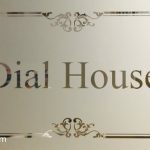 Please note that both Antique Copper and Antique Iron leads carry a premium charge so please receive a quote before adding these leads to your standard order. 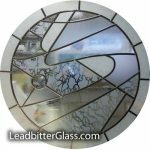 This new colour coated lead gives an amazing finish to the glass design. Again, the colour is applied to the lead in a technique known as powder coating and this process gives an amazing finish. 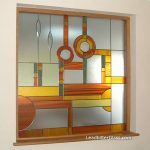 Note: this leaded glass is not guaranteed for external use so should only be used for internal glass or locked inside of triple glazed units. 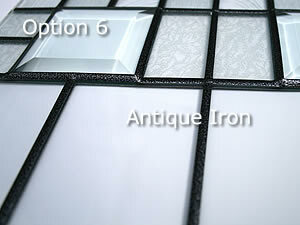 Antique Iron lead can be used in conjunction with our coloured glass film to create coloured leaded glass designs. This lead can also be used to surround bevels from our extensive bevel range and by choosing the right coloured film to compliment the design, Antique Iron Lead could be the ideal choice for your leaded glass project. 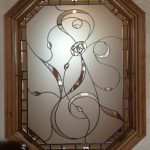 This lead is also ideal for creating Wrought Iron effect designs for windows and we will be adding Wrought Iron style designs to our Gallery soon. 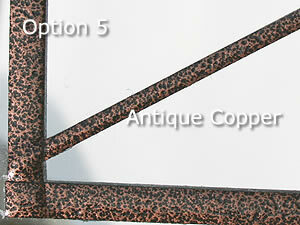 Please note that both Antique Copper and Antique Iron leads carry a premium charge so please receive a quote before adding these leads to your standard order.